Knowing when to write a formal business letter versus a business email may come easily to people who are comfortable conveying messages in various formats; however, there are several factors to consider when choosing the medium. Factors such as expedience, formality, confidentiality and even the addressee's rank or status should be considered when you make a decision to write. The first thing that distinguishes a business letter from a business email is that a letter is generally considered to be hard copy, and the business email is a soft copy – an electronic message. After you compose a business letter, you print it, seal it in an envelope, affix postage and use a service such as the U.S. Postal Service or an overnight delivery company to send the letter to the recipient. 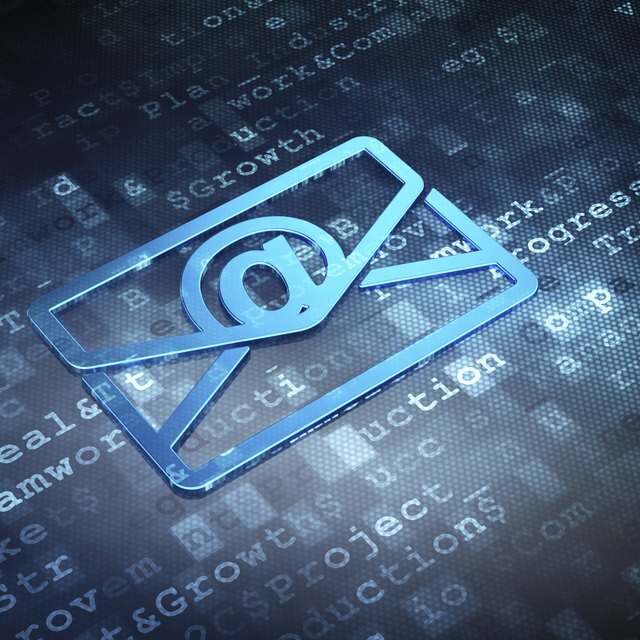 A business email, on the other hand, also is composed usually using a computer or electronic means, but it is electronically dispatched to the recipient in a matter of just a few seconds. The soonest a business letter will generally arrive is the day after you send it via snail mail or a delivery service like FedEx. If you need the letter to arrive sooner, you can hire a courier for same day delivery. You will incur a cost with either option – either a postage stamp or a delivery fee. If you want an urgent message to arrive immediately, your best option is to send a business email. A firewall is only a slight obstacle that might delay delivery, but even then, the delay is practically inconsequential. If you are writing a formal communication, it's likely that you want to convey your message in a business letter. For example, if you are writing about a contractual issue, it's wise to have a hard copy of your correspondence. The disadvantage to this is that pieces of paper can get lost, and a business email can remain in an electronic folder forever. A business email can convey the same message, but if it is a serious matter, business email often is seen as less formal than a business letter. If your communication requires an ink signature, you obviously cannot sign a business email in ink. You can affix an electronic or digital signature to an email message, however. According to the Northern Michigan University Writing Center, the commonly used format for business letters is block style. Every section of the letter is flush with the left margin in the traditional block style. A modified block positions the closing salutation and signature at the bottom middle section of the letter; semi-block format means the paragraphs are indented. If you are writing a business email, it's easy to replicate the traditional block format by typing your greeting, body and closing salutation flush with the left margin, because if you tab over for paragraph indents and closing salutations, the format might look odd, depending on the size of the monitor or screen from which the recipient reads the communication. You can use a watermark on a hard-copy letter to indicate "Confidential," or you can mark the business email Confidential by clicking one of the options that your email program provides. Neither a business letter nor a business email can guarantee absolute confidentiality because the recipient can photocopy the letter or simply forward the email to someone who was not privy to the initial communication. In both cases, you must rely on the integrity of the recipient to maintain the confidentiality of your correspondence. A supervisor writing to a direct report is likely to use email for communicating an informal message, such as notification that she will be out of the office. She needn't provide her staff with a formal letter for such routine correspondence. On the other hand, if she is communicating a policy directive or issuing a commendation or disciplinary action, a hard-copy might be the preferred format, and that's if the company maintains paper records. In the case of paperless offices, a business email is the required form of communication, regardless of the subject matter. In another instance, if a direct report is writing to her supervisor to tender her resignation, a hand-delivered business letter opens the door for a brief conversation (if desired) about the reasons she is resigning because the letter may not contain such details.